This material is intended for clinicians and vestibular scientists. The HIT test is a bedside technique used to diagnose reduction in vestibular function in one ear vs. the other. It describes the result of having an examiner abruptly accelerate and then decellerate the head, moving the head in rapidly at high speed and then stopping it. The term "HIT" is generally used for a sudden rotational movement about the up-down (vertical) axis of the head. A similar "impulse" can also be delivered about a linear axis -- this is generally called the "head heave test", with the word "heave" denoting that the movement is lateral along the interaural axis. In both cases, the trajectory of motion consists of something that looks a bit like a "bell curve" of rotational velocity in one case, and of linear velocity in the other. Actually the name "impulse" is not the most accurate -- while it makes for a convenient and euphonious "HIT" description. The term impulse in engineering means a force (i.e. an acceleration) that acts for a very short time. To be accurate from the engineering perspective, we would need to only consider the acceleration, and not the decelleration force. The HIT test, and its instrumented cousin the "VHIT" test, is one of several bedside methods offering similar information concerning how well the vestibular ocular reflex compensates for a change in head position. The table below provides our opinions regarding their general clinical characteristics. The HIT, like head-shaking nystagmus, is a method of measuring directional asymmetries in vestibular responses. Gain is usually expressed in terms of peak eye-velocity/head-velocity, but with the HIT/VHIT tests, the situation is not as clear as it appears that the output depends not only on velocity but also on acceleration. The dependence of the output on aspects of the input, tells us that the response is nonlinear. This is not unexpected as of course, we are attempting to measure an asymmetry, which is a nonlinearity by itself. The asymmetry in vestibular output for large inputs was first observed by Ewald (Ewald 1892), and is referred to as Ewald’s second law. In its specific form it states that ampullopetal endolymph flow in the horizontal canal causes a greater response than ampullofugal endolymph flow (Ewald 1892; Baloh and Honrubia 2001). In its general form it states that excitation is a relatively better vestibular stimulus than is inhibition (Leigh and Zee 2006). Ewald’s second law is thought to be due to the inability of inhibitory stimuli to decrease vestibular nerve firing rates to less than zero (Baloh, Honrubia et al. 1977; Hain and Spindler 1993). Ewald used a very powerful complex stimulus -- a plunger in the vestibular labyrinth, and his output was eye velocity. (Vestibular physiologists would shudder at this oversimplification). 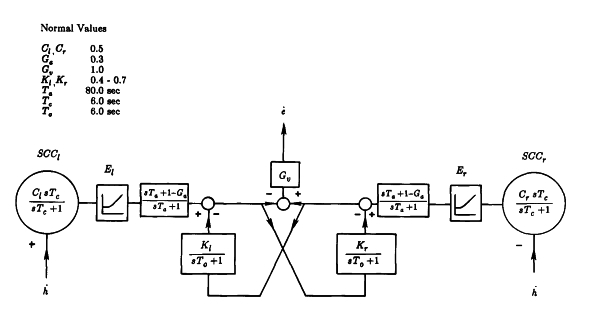 In the figure above, the acceleration term has been left out -- so to model the HIT, one would need to add an extra term to the canal transfer function as well as to the central processing in order to take out the acceleration sensitivity (so that eye velocity doesn't become proportional to head acceleration). Continuing, because firing rate has a lower limit of 0 spikes/second, there is a saturation of the overall response for the nerve. In the diagram above, this is the little box with the curved line (nonlinearity) inside of it. Other machinery in the model above that are not necessary to cover right now are the cross-connected boxes that implement velocity storage. This is needed to explain head-shaking nystagmus, but irrelevant to the HIT. This (fairly) simple theory explains the HIT in quantitative terms. Perhaps because it is so simple to do and takes no equipment, the HIT test has been the subject of an immense number of recent papers. As of late 2014, a search brought up about 200 papers, with the earliest occuring in 1997. We find it puzzling that there are some many papers about HIT and relatively fewer about the more useful vibration and head-shaking nystagmus tests. What is the HIT test good for ? The HIT is reported to be very sensitive to complete vestibular loss but insensitive to mild or moderate vestibular loss (Beynon et al, 1998; Hamid 2005; Harvey et al, 1997). Hamid said that more than a 50% canal paresis is needed for a HIT test to be positive. This makes its sensitivity similar to vibration and head-shaking nystagmus. In other words, the HIT test is not positive in most cases of vestibular neuritis, because most cases are not accompanied by a canal paresis of 50%. In our clinic setting, we think the HIT test is poorer than the vibration test for localization in all comers, as it can fail (especially in compensated patients) and is vulnerable to bias. However, HIT is a very good way of detecting uncompensated unilateral vestibular loss, because the HIT is more specific than vibration and head-shaking. When one has a positive HIT, head-shaking nystagmus, and vibration induced nystagmus all at the same time, one can be quite certain that there is a highly significant unilateral vestibular weakness. So what common sense and literature data says, is that the HIT test has a small useful role to contribute in vestibular diagnosis. It does not replace ENG (which is sensitive to 35% weakness), or vibration (which works 20 years later), or Rotatory chair (which checks the low frequencies). However, it is a very quick way to detect a unilateral loss. The HIT test in the ED. The HIT test is fast -- it just takes a few head turns to decide whether it is positive or not. This, as well as the lack of any equipment needed has led to its use in the emergency department. In essence, the idea is that if the HIT is positive, it is probably an inner ear problem, and if it is negative, probably not. This probably does work most of the time. Recently Chen et al (2014) reported that the HIT test is indeed positive in unilateral vestibular loss, but only sometimes positive in cerebellar strokes. They called the strokes where the test failed, and the patients looked like peripheral lesions, "pAICA" strokes, and the strokes where the test succeeded and the patients looked like normals or mild bilaterals "cAICA" strokes (AICA is the anterior inferior cerebellar artery, from which the labyrinthine artery originates). Their study showed that this general idea works most of the time. One would think that migraine patients would be normal and have normal HIT tests. So far, as of 2014, no study has been made of this. One would think that Meniere's patients would also have largely normal HIT tests, as it is rare for patients with Meniere's to have more than 50% weakness. Zuleta-Santos et al (2014) studied 36 patients and did indeed find a rather diverse set of results, and noted that the more tests that were done, the more abnormalities were found (as any sensible person should expect). HIT (head impulse test) -- rotational version. Click here to see movie of HIT test in a person with a vestibular nerve section (on the left side). While there is little question that this person has a very significant vestibular lesion, as caloric testing documented only a 4 deg/sec response in the left ear (right ear had 40), we find it hard to appreciate the 10:1 difference in vestibular responsiveness from the HIT recording. The patient's head is rapidly rotated by the examiner (abruptly and with high acceleration) about 20 degrees to the right or left. The patient is told to fixate on the examiners nose. After the head stops, the examiner watches the patient's eye to see whether or not a refixation saccade is needed to get the patient's eye on the examiners nose. A reliable and significant refixation saccade is judged as positive. On the graphic to the above, on the bottom, the upgoing (rightward) eye movements are in the "good" direction, and the downgoing (leftward) eye movements are in the "bad direction". This is for a patient who just had a vestibular nerve section. (graphics from Dr. Dario Yacovino). The bedside test requires a subjective judgement on the part of the examiner, who also controls the stimulus. This is not a good situation. The HIT test also is vulnerable to prediction as patients who know which way their head will be turned, can generate "covert" saccades. (Weber et al, 2008). Another name for these saccades are "vestibular catch-up saccades". (Tian and Crane, 2000). These are shown above. The HIT test requires rapid head movements, which may cause neck pain in persons with arthritis. So far, we are unaware of any reports of carotid or vertebral dissection due to the HIT, but we would expect that it would have a similar prevalence of vascular compromise as do similar chiropractic maneuvers. Heart block has been rarely reported after the HIT (Ullman and Edlow 2010). This is difficult to comprehend. The HHT is so far not been used often at the bedside. The head is moved linearly along the interaural axis (Kessler et al, 2007). The heave is about 5-6 cm in excursion. There are some practical problems with this procedure as it is difficult to confine the head to a single direction, and also (perhaps), some safety concerns incurred by very rapid acceleration/acceleration movements similar to those that occur from chiropractors or in whiplash injuries. Like the HIT, the head-heave test depends on a subjective judgement of the examiner, and is likely affected by prediction (although the test is very little studied). Allowing the patient to rotate their own head (active head rotation) is not as sensitive as the passive HIT as patients can use prediction to normalize their performance (Black et al. 2005). Similarly, motorized devices can be used to automate the test (Aalto et al, 2002). This is impractical for clinical use. The "Video HIT" or VHIT device is available in several configurations. More about the VHIT is here. While the author of this page has never seen any damage result from the HIT or VHIT test, simple logic would suggest that a test that involves rapid head rotation could occasionally injure the neck or the vertebral arteries. Similar considerations apply to chiropractic treatment, and certainly there are many examples of neck pain, and a few cases of vertebral artery dissection after similar chiropractic "snapping" procedures. Of course, these risks have not stopped chiropractors from treating neck pain, and we don't think that they should stop vestibular clincians either. That being said, we do not think VHIT is appropriate for "all comers" -- i.e. as a screening test for vestibular disorders. We think that this role is far better filled by the bedside frenzel goggle test. The HIT appears to be most useful as part of a rapid battery of bedside tests (as described above). (Mandala et al. 2008). It provides unique information about compensation (covert saccades), and ultimately might end up being primarily useful to vestibular physical therapists. With the HIT or VHIT, by combining several quick clinical tests, the "dizzy doctor" can quickly determine the status of the inner ear. We would not advise practicing without a bedside video frenzel however, so the VHIT device does NOT substitute for a method of monitoring eye movements in the dark. We do not advise reliance on the HIT test to detect unilateral loss at the bedside, because of covert saccades. If it is positive - -it was productive. If negative, you still don't know for sure, but combined with the vibration/HSN test -- you should be OK. The VHIT probably is sufficient to detect unilateral loss, which comprises a small but important fraction of all dizzy patients. Aalto, H., T. Hirvonen, et al. (2002). "Motorized head impulse stimulator to determine angular horizontal vestibulo-ocular reflex." J Med Eng Technol 26(5): 217-22. Aw, S. T., M. Fetter, et al. (2001). "Individual semicircular canal function in superior and inferior vestibular neuritis." Neurology 57(5): 768-74. Beynon, G. J., P. Jani, et al. (1998). "A clinical evaluation of head impulse testing." Clin Otolaryngol Allied Sci 23(2): 117-22. Black, R. A., G. M. Halmagyi, et al. (2005). "The active head-impulse test in unilateral peripheral vestibulopathy." Arch Neurol 62(2): 290-3. Chen, L., et al. (2014). "Head impulse gain and saccade analysis in pontine-cerebellar stroke and vestibular neuritis." Neurology 83(17): 1513-1522. Cremer, P. D., G. M. Halmagyi, et al. (1998). "Semicircular canal plane head impulses detect absent function of individual semicircular canals." Brain 121 ( Pt 4): 699-716. Ewald, J. R. (1892). Physiologische Untersuchungen über das Endorgan des Nervus octavus. Wiesbaden, Germany, Bergmann. Hain, T. C. and J. Spindler (1993). Head-shaking nystagmus. The Vestibulo-Ocular Reflex and Vertigo. J. A. Sharpe and H. O. Barber. New York, Raven Press: 217-228. Hain, T. C., M. Fetter, et al. (1987). "Head-shaking nystagmus in patients with unilateral peripheral vestibular lesions." American Journal of Otolaryngology 8(1): 36-47. Harvey, S. A., D. J. Wood, et al. (1997). "Relationship of the head impulse test and head-shake nystagmus in reference to caloric testing." Am J Otol 18(2): 207-13. Jorns-Haderli, M., D. Straumann, et al. (2007). "Accuracy of the bedside head impulse test in detecting vestibular hypofunction." J Neurol Neurosurg Psychiatry 78(10): 1113-8. Karlberg, M., S. T. Aw, et al. (2002). "Vibration-induced shift of the subjective visual horizontal: a sign of unilateral vestibular deficit." Arch Otolaryngol Head Neck Surg 128(1): 21-7. Kingma, H., A. Meulenbroeks, et al. (2000). "Vestibular ocular reflexes in Meniere's disease patients evaluated by passive high frequency head rotation (yaw) and sidewards acceleration." Acta Otolaryngol Suppl 544: 19-26. Lehnen, N., S. T. Aw, et al. (2004). "Head impulse test reveals residual semicircular canal function after vestibular neurectomy." Neurology 62(12): 2294-6. Hamid, M. (2005). "More than a 50% canal paresis is needed for the head impulse test to be positive." Otol Neurotol 26(2): 318-9. Mandala, M., D. Nuti, et al. (2008). "Effectiveness of careful bedside examination in assessment, diagnosis, and prognosis of vestibular neuritis." Arch Otolaryngol Head Neck Surg 134(2): 164-9. Migliaccio, A. A., C. C. Della Santina, et al. (2005). "The vestibulo-ocular reflex response to head impulses rarely decreases after cochlear implantation." Otol Neurotol 26(4): 655-60. Perez, N. and J. Rama-Lopez (2003). "Head-impulse and caloric tests in patients with dizziness." Otol Neurotol 24(6): 913-7. Zulueta-Santos, C., et al. (2014). "The vestibulo-ocular reflex assessment in patients with Meniere's disease: examining all semicircular canals." Acta Otolaryngol 134(11): 1128-1133.